Blickensderfer No. 5 is a photograph by Linda Stern which was uploaded on September 2nd, 2018. This Blickensderfer No. 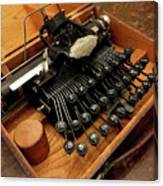 5 typewriter patented in the late 1800s, was originally used at a fish store in the Germantown section of Philadelphia, probably at the beginning of the 20th Century. 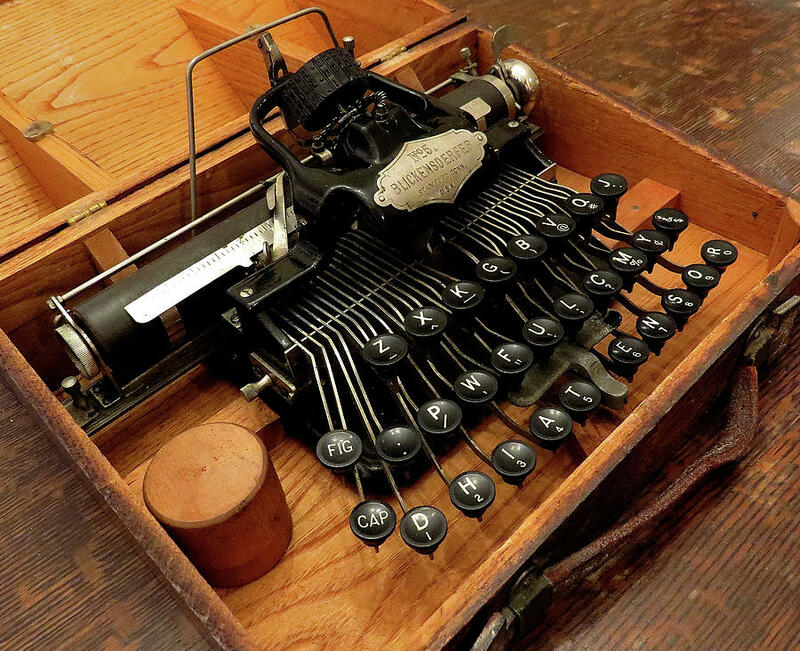 This Blickensderfer Moderl number 5 typewriter was manufactured by the Blickensderfer Manufacturing Compmany of Stamford, Connecticut between 1893 and 1896. 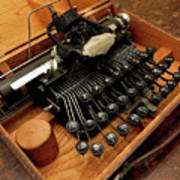 The Blickensderfer was advertised as having one quarter of the parts that other typewriters used, allowing for easier operation, maintenance, and repair. Other features include a tabulator and a scaled with slots for carriage stops. Blickensderfer typewriters also had a patented type action using their patented “type wheel,” a metal wheel containing all the characters which would rotate and strike the paper to create the inked mark. The type wheel allowed for easier type alignment, less jamming, and an easier way to change type fonts. The simplicity of the Blickensderfer made it portable, and this model had a wooden cover with a leather handle for easy carrying. While QWERTY keyboards could be ordered, by default most Blickensderfer typewriters eschewed the QWERTY keyboard in favor of a “Scientific” keyboard that put the most used letters “D, H, I, A, T, E, N, S, O, and R” on the bottom row nearest the space bar to minimize hand movement.